Sportaid’s handy Monark arm/leg training equipment is ideal for warm up and exercises from wheelchair or standing position. The upper body ergometer and trainer run smoothly and are excellent additions for rehabilitation centers. 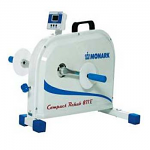 The Monark Disability Rehabilitation Trainers is especially important for people who have been hospitalized and require rehabilitation based on reliable measuring methods. You can use this equipment with or without the guidance of your physiotherapist in the hospital or rehab centers. Sportaid offers this trainer on sale with Low Price Match Promise. Select from the top manufacturers and save big with Sportaid.com's everyday low prices. 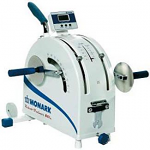 Save up to 10% on Monark Disability Rehabilitation Trainers by buying from Sportaid! Enjoy a Healthier Lifestyle by Choosing the Monark Disability Rehabilitation Trainers from Sportaid.com! Sportaid offers reliable options for arm leg training such as the Monark Compact Rehab 871 E and the Monark Rehab Trainer 881E. The effective and powerful trainers offer a complete workout with high performance. Its reliable measuring methods are extremely useful while exercising. Feel free to call 1-800-743-7203 for expert assistance. And be the best you can be by choosing Sportaid as your Disability Sports Equipment supplier. We guarantee satisfaction for our most loyal customers, and we extend that offer to new customers as well. After over 25 years in the business helping people find Monark Disability Rehabilitation Trainers at lowest prices, we continue to lead the industry! We carry a large selection of wheelchair cushions, wheelchair parts, and wheelchair accessories. We are capable of beating any competitor's advertised price, just call! Our customer service staff has over 50 years of experience, plus over 90 years of combined wheelchair use experience. We look forward to working with you! I've been using the Rusch Gold Foley Catheters for about 6 months. They work great for me. I used to use silicone but found these are much easier on my urethra.